Syria war: Why was Shayrat airbase bombed? Shayrat airbase was the target of the US' first deliberate direct attack on Syrian forces since the start of the war six years ago. So why was it chosen? 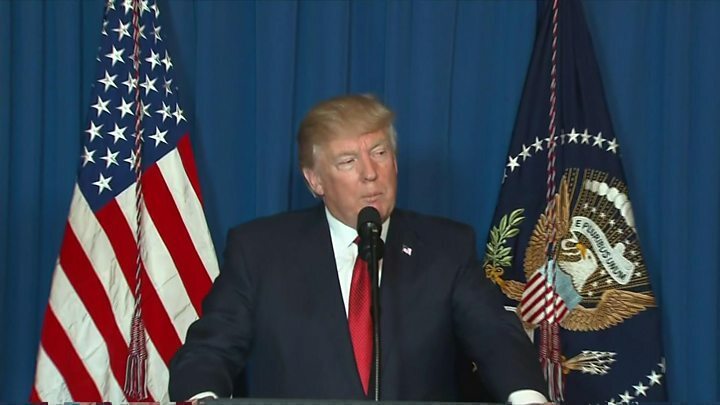 Some 59 cruise missiles were fired at the Syrian Air Force facility in response to what President Donald Trump said was a chemical weapons attack on a rebel-held town three days before. Pentagon spokesman Capt Jeff Davis said Shayrat airbase was used to store chemical weapons, and that US intelligence assessed that aircraft from there had dropped bombs filled with a nerve agent on Khan Sheikhoun, killing more than 80 people. Syrian President Bashar al-Assad has denied ever having used chemical weapons. 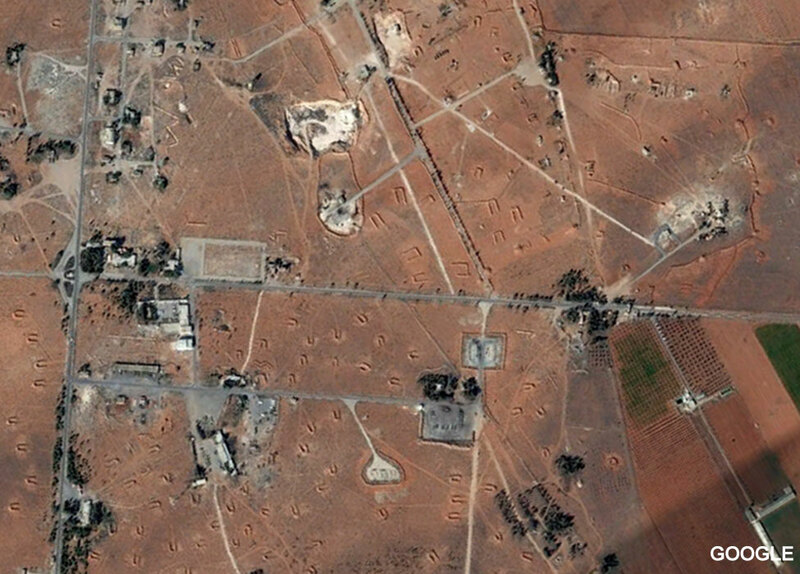 Shayrat airbase is located in Homs province, about 25km (15 miles) south-east of the city of Homs. Covering about 10 sq km (4 sq miles), it has two 3km-long (2 mile) runways, as well as dozens of hangars, buildings and storage facilities. The airbase has been occupied by the Syrian military throughout the country's six-year civil war, and Syrian Air Force Su-22 and MiG-23 warplanes fly from there. The airbase was used to store chemical weapons until 2013, when Mr Assad agreed to the destruction of the country's declared chemical arsenal after his forces were accused of firing rockets filled with the nerve agent Sarin at rebel-held suburbs of Damascus, killing hundreds of people. In early November 2015, just over a month after launching an air campaign against Mr Assad's opponents, the Russian military reportedly began using Shayrat as a forward operating base for Mi-24 and Mi-35 attack helicopters. 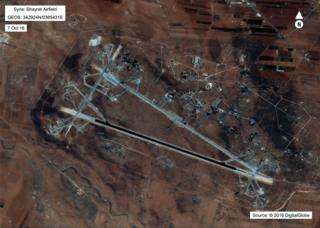 Satellite imagery obtained by Stratfor that December showed construction work to improve the airbase. The company's analysts said the work and the presence of newly deployed helicopters suggested the base was gaining importance for the Syrian government and Russia as they sought to counter jihadist militants from so-called Islamic State (IS) in Homs province. The move was denied by the Russian defence ministry, but further satellite images taken at the end of March 2016 showed several Ka-52 Alligator and Mi-28N Night Hunter attack helicopters had also arrived, according to IHS Jane's. Fighters from Lebanon's Hezbollah movement and Iranian-backed Iraqi militias supporting the Syrian army on the ground are also believed to have used Shayrat. On Tuesday, US military radar systems monitored a Syrian Air Force fixed-wing aircraft take off from Shayrat and fly over Khan Sheikhoun on two occasions - at 06:37 local time (03:37 GMT) and 06:46. 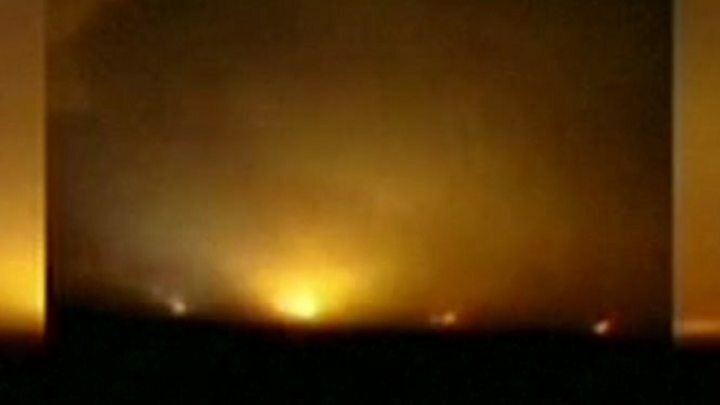 US military officials told NBC News that the radar systems picked up flashes on the ground, indicating that ordnance had been dropped on the rebel-held town. At that same time, hundreds of people on the ground began suffering symptoms consistent with reaction to a nerve agent, according to the doctors and nurses who treated them. The opposition-run health directorate says at least 84 people died. 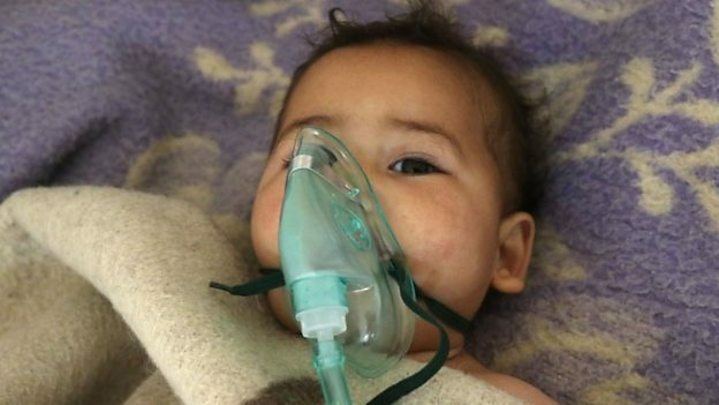 Russia said the Syrian jets had hit a rebel depot full of chemical munitions, but Mr Trump said "there can be no dispute that Syria used banned chemical weapons". Sources told the Guardian newspaper that US intelligence officials believed Russian personnel were at Shayrat "when Sarin was loaded on to a Syrian jet", but that "they have not established whether the Russians knew it was happening". The Syrian pro-opposition website, Orient News, meanwhile said the jet's pilot had been identified as the commander of an Su-22 squadron at Shayrat. At about 03:40 local time (00:40 GMT) on Friday, two US Navy destroyers in the eastern Mediterranean Sea launched a total of 59 Tomahawk Land Attack Missiles (TLAMs) at the airbase. Capt Davis said they targeted "aircraft, hardened aircraft shelters, petroleum and logistical storage, ammunition supply bunkers, air defence systems, and radars", describing them as "things that made the airfield operate". "We are assessing the results of the strike," he added. "Initial indications are that this strike has severely damaged or destroyed Syrian aircraft and support infrastructure and equipment at Shayrat airfield, reducing the Syrian government's ability to deliver chemical weapons." Capt Davis stressed that the US had taken "extraordinary measures" to avoid civilian casualties and that planners "took precautions to minimise risk to Russian or Syrian personnel located at the airfield". Russian forces were notified in advance of the strike using a "de-confliction line" set up to ensure US warplanes attacking IS positions in Syria are not accidentally attacked by Russian jets, he added. Mr Trump's National Security Adviser, H R McMaster, said measures had also been put in place to avoid hitting what were believed to be stores of Sarin at Shayrat, so that it "would not be ignited and cause a hazard to civilians or anyone else". "Obviously, the regime will maintain the certain capacity to commit mass murder with chemical weapons, we think, beyond this particular airfield. But it was aimed at this particular airfield for a reason, because we could trace this murderous attack back to that facility." A Syrian living a few kilometres from the airbase told the BBC that he was awoken at about 03:45 by the force of the explosions. When he looked outside, he saw larges areas on fire, he said. A cousin doing military service said he had gone to check on his friends at the facility and seen "total devastation", he added. The Syrian military said the strike had left six personnel and a number of others injured, and caused "huge material damage". The official Sana news agency reported that nine civilians living in villages near the airbase, including four children, had also been killed in the strike. 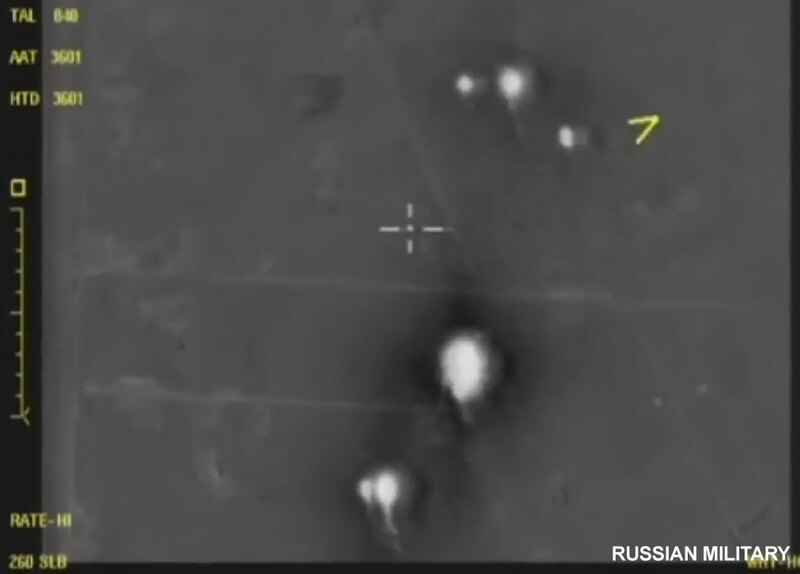 A Russian defence ministry spokesman said an equipment depot, a training building, a mess, six Syrian Air Force MiG-23s in repairing hangars, as well as a radar station were destroyed. The runway, taxiways and aircraft at parking places were not damaged, he added. The spokesman also described the effectiveness of the US strike as "extremely low", saying only 23 missiles had reached Shayrat. "It is obvious to any specialist that the decision to carry out an air strike on Syria had been taken in Washington long before the events in Khan Sheikhoun, which only served as a formal pretext," he said, explaining that a "wide range of reconnaissance and planning measures" would have been necessary.